The one good thing that has come out of my not being able to exercise anymore is that I have more time to fix breakfast in the morning. It’s a mixed blessing for Tom & Jewel because it creates more dishes for them, but they have both enjoyed trying new recipes. 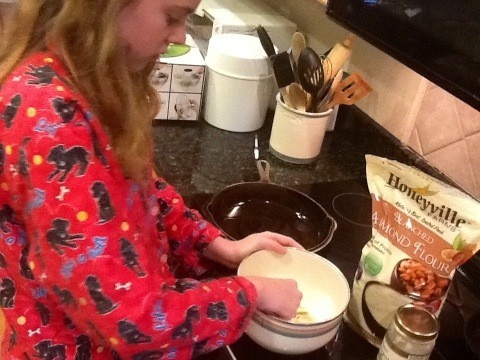 Banana Chocolate Chip Scramble was a huge hit with Jewel. I followed the recipe verbatim, using the smaller amount of chocolate chips & using 1T of coconut oil to make 2 servings. optional ingredients like berries, nuts, etc. First, start drinking coffee. Jewel will be the first to tell you about my much higher success rate at cooking breakfast when adequately caffeinated. 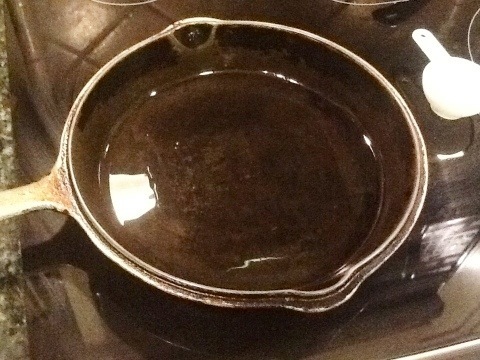 Heat coconut oil in a skillet over medium heat. I can do things like turn on the right burner (or any burner) on the stove when I’ve had some coffee first. Mash the bananas with a fork. 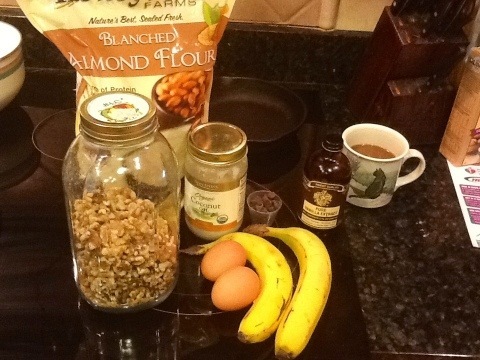 This tastes best when the bananas are fairly ripe. 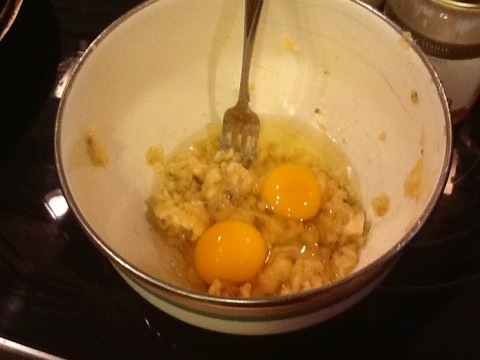 Add eggs and whip together. 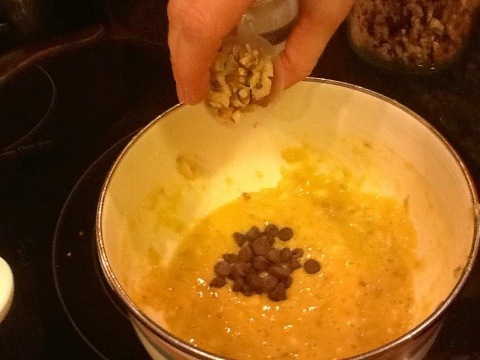 Add chocolate chips and optional mix-ins. 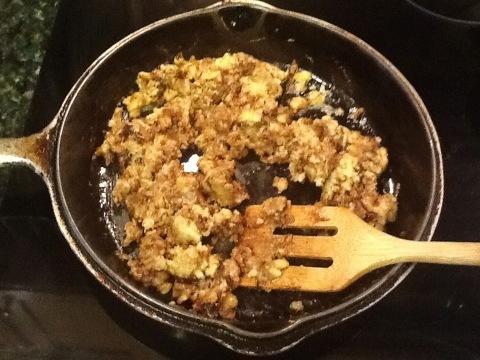 I added walnuts. 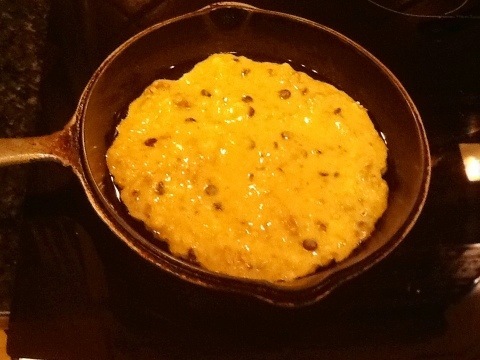 Pour batter into hot frying pan and leave alone for about 2 minutes, or until the bottom starts to brown. 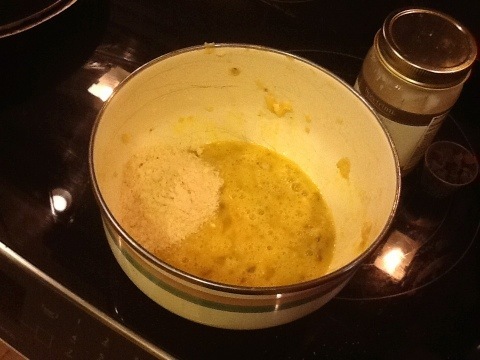 Continue to scramble, allowing the bottom to brown each time. Jewel thought this looked and tasted like mashed up banana muffins. 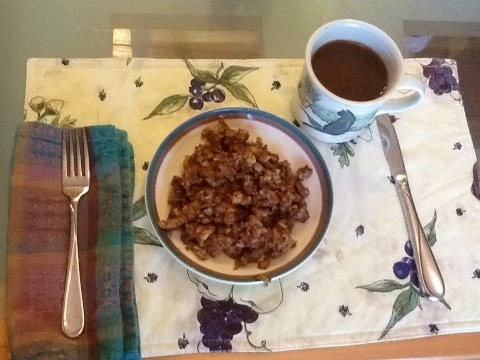 This is one of my favorite new breakfasts, and it is quite filling to boot. 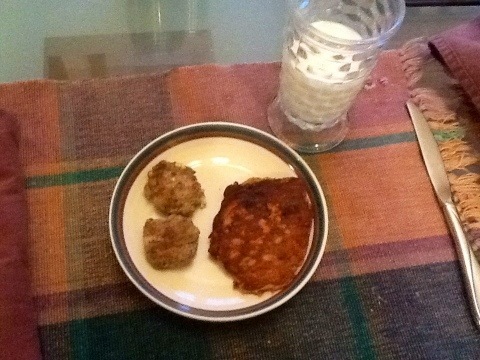 Yesterday I made Carrot Cake Pancakes. I didn’t have time to photo document since I was pressed for time. These really taste like carrot cake and are very nutritious. I served them with sausages. The pancakes are better with maple syrup, but they actually taste good plain as well.